Immediately on his election in 1904, Roosevelt committed what most of his advisers and later historians considered his greatest political blunder: he announced then that he would not under any circumstances be a candidate for reelection to a third term in 1908. Certainly the move made him something of a lame duck at the outset of his only full administration. Yet, instead of limiting him, it is possible that lame-duck status served Roosevelt's purposes well. He may have felt in fact that it freed him morally to move to the far side of constitutional law whenever his view of the national interest required it. That, at least, would be consistent with the man's unwillingness to be controlled by anything less than his own moral commitment to serving the public interest as steward of the nation. Theodore Roosevelt (left) was noted for his conservationist policies as president. 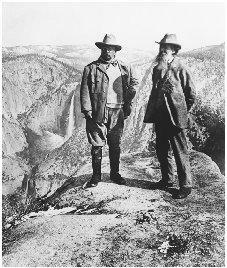 Here he stands with naturalist John Muir at Glacier Point, Yosemite Vally, California, in 1906. They collaborated on setting aside forest preserves in the area. power that is restrained by their own sense of justice alone. Blum has written, "It did not require eight years or even four for a president to lead the nation beyond the edge of war, or to employ his 'bully pulpit' to lie to the people, or to employ his authority to subvert the rights of individuals." Roosevelt in fact did none of these things, Blum notes, but he wonders if Roosevelt would have been so restrained if he had confronted global war and massive economic collapse, as some future presidents had to. On the other hand, although Roosevelt was quite capable of magnifying a sense of crisis as occasion demanded, his presidency did not in fact confront great national or international troubles that might have tested his restraint. More than that, sensitivity to the abuse of presidential power stems from many decades of strong presidential leadership that by the 1970s eventuated in what came to be called—aptly enough—the Imperial Presidency. Theodore Roosevelt's generation faced the opposite problem—decades of weak leadership in which images of governmental usurpation were served up regularly by special interests trying to preserve their immunity from public control and accountability. Moreover, not even the severest critics of modern government (the lunatic fringe aside) would be comfortable now with the relatively small power that resided in the presidency even at the conclusion of T. R.'s reign. As Richard E. Neustadt noted in his landmark book Presidential Power , "A striking feature of our recent past has been the transformation into routine practice of the actions we once treated as exceptional.. . . The exceptional behavior of our earlier 'strong' Presidents has now been set by statute as a regular requirement." That Roosevelt acted to the degree that he did in advance of such statutory requirements says more for his intelligence than for his recklessness. In the area of foreign policy, however, there is room for serious questioning. To cite Blum once more, Roosevelt's "belief in power and his corollary impatience with any higher law presumed that governors . . . possessed astonishing wisdom, virtue and self-control. As much as anything he did, his direction of foreign policy made that presumption dubious." The key to Roosevelt's foreign policy lay in his division of the world into "civilized" and "barbarous" countries. "Peace cannot be had," he insisted, "until the civilized nations have expanded in some shape over the barbarous nations." Among the civilized nations, his diplomacy sought a balance of power. For the barbarian countries, he was ready to acknowledge an assignment of stewardships among the civilized nations. Russia belonged in Turkestan, Britain in India and Egypt, France in Algiers, and so on. That there were racial implications in his portrait of global statuses cannot be denied, but that they were "racist" in the modern sense cannot be sustained. Roosevelt's estimate of nations and peoples was, as with so many things, conditioned by considerations of power. When Roosevelt expressed condescension or scorn for nonwhite peoples, his attitude originated in the evident weaknesses of the nations where they predominated; he reacted to the weakness, not to the race. Moreover, he never appears to have begrudged respect to individuals whose personal traits diverged from the stereotypes attributed to the ethnic or racial groups with which they were identified. "I suppose we have all outgrown the belief that language and race have anything to do with one another." The same thing is true, he suggested, regarding character. "A good man is a good man and a bad man a bad man wherever they are found." His view of the Japanese should make this clear. Japans' economic and military power won from Roosevelt ungrudging respect for the Japanese people. "I am not much affected by the statement that the Japanese are of an utterly different race from ourselves," he wrote to a British friend during the Russo-Japanese War. To the Japanese, in fact, Roosevelt assigned responsibility for civilizing and policing East Asia, or at least that part which "surrounds the Yellow Sea, just as the United States has a paramount interest in what surrounds the Caribbean." He wrote to his German friend Speck von Sternberg in 1900, "I should like to see Japan have Korea. She will be a check upon Russia, and she deserves it for what she has done." In 1904 he let it be known to both the British and the Germans that Japan ought to have Korea, as well as a role in bringing China "forward along the road which Japan trod" toward membership among the great civilized powers. With Japan's victory over Russia in 1905, Roosevelt moved quickly to reestablish a balance of power in the Far East. Partly for his role in the Portsmouth, New Hampshire, peace conference that concluded the war, Roosevelt was awarded the Nobel Peace Prize in 1906. But Roosevelt never courted "the odium of being a professional peacemaker." He was concerned rather with assuring that Japan's new ascendancy would not go unchecked. To this end, and without consulting Congress or informing the American people, Roosevelt informally committed the United States to the Anglo-Japanese alliance and recognized Japan's hegemony in Korea and its "paramount interest" in Manchuria, in exchange for a Japanese pledge to honor United States sovereignty in the Philippines. It was not until 1925, as the result of historian Tyler Dennett's research, that the American people first learned of the "Taft-Katsura Agreement" and Roosevelt's secret arrangements. To be sure by treaty it was solemnly covenanted that Korea should remain independent. But . . . the treaty rested on the false assumption that Korea could govern herself well.. . . Japan could not afford to see Korea in the hands of a great foreign power.. . . Therefore, when Japan thought the right time had come, it calmly tore up the treaty and took Korea. It was, he said, a procedure "like that done under similar circumstances by the chief colonial administrators of the United States, England, France, and Germany." With such chilling candor about tearing up "solemnly covenanted" treaties, Roosevelt made clear his view that power established its own legitimacy and that those without power need expect no law to be honored in their favor. Roosevelt's policies in the Caribbean of course fitted that view perfectly. The establishment of a protectorate in Cuba, the "taking of Panama," and the declaration of what came to be called the Roosevelt Corollary to the Monroe Doctrine all were founded on the assumption that "great powers" have the moral right to "spank" small countries (as Roosevelt put it) whose squabbling or inadequacies imperiled the security or merely the tranquillity of their more civilized neighbors. The Cuban case in some respects impels a musing that "considering the opportunities" one must wonder at the restraint. The United States had gone to war with Spain in 1898 at least partly to pacify the troubled nearby island of Cuba. To underline its "missionary" objectives, it had declared in advance its commitment to Cuba's independence. Yet independence scarcely would guarantee no further disorders, nor would it prevent other powers from exploiting new disorders to replace Spain on the island. In belated recognition that the whole enterprise lacked logic if the United States simply withdrew without some way of exercising control over what happened to Cuba, the Roosevelt administration drafted, and the Senate ratified, a treaty that recognized Cuba's independence but that included a proviso. Called the Platt Amendment, it forbade Cuba from making any treaties or financial commitments with foreign governments that might compromise its independence, permitted United States oversight of Cuban finances, and authorized the United States to quell any internal disorders that might make Cuba prey to foreign intervention. Although the reasoning by which Roosevelt justified Japan's annexation of Korea could have been applied to Cuba (to be sure, the United States faced no power so close as Russia was to Japan), the United States minimized its involvement with the Cubans. Cuba did become a protectorate whose internal disorders provoked one three-year military presence beginning in 1906 and several other actions in succeeding decades. But Roosevelt's preferred method of stabilizing the island was to improve its economy. To this end, he persuaded Congress, over ferocious opposition from domestic sugar growers and Republican protectionist ideologues, to give Cuban sugar, the island's biggest economic asset, preferred import status into the United States market. The Panama episode had its immediate cause, as is legend, in the ocean-to-ocean dash of the USS Oregon around Cape Horn in 1898 to join the U.S. squadron off Cuba before the Spanish-American War ended. The epic argued the necessity for a canal across the Central American isthmus. (Californians and other westerners had also clamored for a canal to reduce their dependence on the monopoly power of transcontinental railroad companies.) Original plans for such a canal through Nicaragua blew up with the eruption of a volcano near the proposed site. There remained an abandoned project through Panama begun by a French company that still held a valid charter. Panama at the time was an unruly province of Colombia that had virtually defied governing for eighty years. The trouble lay, as Walter LaFeber writes, in "the type of person the Isthmus attracted—the rootless, lawless transient who obeyed no authority . . . 'a community [according to one contemporary observer] of gamblers, jockeys, boxers, and cockfighters.' " During the course of the nineteenth century, Colombia had to cope with more than fifty insurgencies aimed at secession. At least four times, Colombia called on the United States, with which it had arranged treaty obligations in 1846, to assist in repressing rebellions. The only asset of the province was that it lay in the way of seagoing traffic between the east and west coasts of North and South America. For this, as the Americans contemplated a canal, Colombia prepared to exact its price. Colombia initiated the negotiations in 1900. In January 1903, Roosevelt offered Colombia $10 million plus $250,000 per year for a ninety-nine-year lease on a six-mile-wide canal zone. In addition, $40 million was approved by Congress to pay off the Panama Canal Company (PCC), which held the rights to the route. The Hay-Herran treaty embodying the terms was ratified by the United States Senate, but in August the Colombian Senate unanimously turned it down. They wanted more money, including (they later specified) $15 million of the $40 million earmarked for the PCC. Roosevelt exploded, using a variety of tame expletives to describe the Colombian legislators—"inefficient bandits," "a corrupt pithecoid community," "homicidal corruptionists," and so on. What lay at the heart of Roosevelt's exasperation was the conflict between a political ethic and a social ethic to which he was equally and profoundly committed. The social ethic dictated that reward should go to work and ingenuity. It was the work and ingenuity of others needing to cross the isthmus that gave value to the Colombian property and, indeed, provided livelihoods for the "community of gamblers, jockeys, boxers, and cockfighters" that prevailed there. On the other hand, the political ethic that informed Roosevelt's leadership dictated a strong regard for property rights and national sovereignty. A more conservative nationalist would have yielded the point to Colombia on the principle of sovereign prerogatives. But Roosevelt could not leave it at that. Progress in civilization demanded that legal "technicalities" give way to the more fundamental moral imperatives—at least when the former were unsupported by adequate power. Meanwhile, suggestions flew from within and without the administration that perhaps the United States ought to encourage, rather than to help Colombia repress, the next Panama rebellion. But as late as October 1903, Roosevelt wrote privately that though he would delight in Panamanian independence, "I cast aside the proposition made at this time to foment the secession of Panama. Whatever other governments do, the United States cannot go into securing [the canal] by such underhand means." He preferred the more direct approach: he drafted a message for Congress asking authority to seize the isthmus. The draft was never completed. Taking the many cues that had been given, the Panamanians revolted. Without Congress' authority, and in spite of United States treaty obligations to Colombia, the president then dispatched the USS Nashville with covert instructions to block Colombian military efforts to suppress the new insurgency. With success of the rebellion assured, Roosevelt then negotiated the terms of United States recognition of Panamanian independence, not with any bona fide representative of the Panamanian government but with Philippe Bunau-Varilla, a French operator who was acting both as political broker and agent for PCC investors. Presented with a fait accompli, the Panamanians accepted the treaty in anguish, having yielded more of their sovereignty and territory than had been included in the pact offered Colombia. For public purposes, and in deference to the prevailing political ethic, Roosevelt loudly denied any United States complicity in the rebellion. Privately he wrote, "The United States is certainly justified in morals, and therefore . . . in law . . . in interfering summarily in Panama and saying that the canal is to be built and that they [the Colombians] must not stop it." But his attorney general, Philander Knox, is supposed to have said to him, "Oh, Mr. President, do not let so great an achievement suffer from any taint of legality!" Years later, in his autobiography, Roosevelt boasted, "I took the Isthmus, started the canal and then left Congress not to debate the canal, but to debate me." Having acquired the canal in order to alleviate one kind of strategic problem, Roosevelt acquired for his country new strategic burdens. Outposts beyond the continental borders require protection. Insofar as the canal would become a vital part of the American strategic periphery, the possibility of encroachment in the area by any of the world's powers had to be viewed with concern. The most likely threat came from European powers moving in on Caribbean countries that got into financial trouble with their European creditors. Shortly before becoming president, Roosevelt had written to his German friend Sternberg, "If any South American State misbehaves towards any European country, let the European country spank it." As president in 1904, when the Dominican Republic failed to make its debt payment because of local disorders and several European countries prepared to dispatch warships, Roosevelt stayed cool. "If I possibly can, I want to do nothing," he wrote. But then an international court of arbitration adjudicating the claims of European creditors against Venezuela ruled disproportionate awards to those bondholders whose government (Germany) had sent warships to bombard the Venezuelan coast. Roosevelt finally understood that unless the United States stepped in the Caribbean would teem with European navies. "We must ourselves undertake . . . [to see to it that] a just obligation shall be paid," he told Congress. It was, he pointed out, ultimately a matter of national security. In 1907, when disorders again threatened payments on the Dominican Republic's foreign debts, Roosevelt, acting on his authority as commander in chief, took over the Santo Domingo customhouse. And so the Roosevelt Corollary to the Monroe Doctrine became the foundation for repeated United States intervention in the governing of countries in, or bordering on, the Caribbean. It remains in place today.